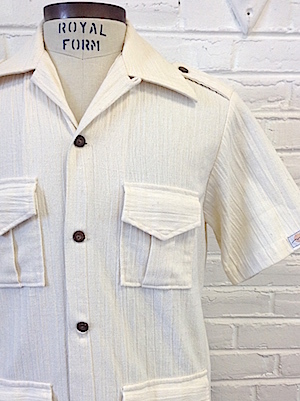 Home > Vintage Jackets > All Vintage Jackets > (42) Mens Vintage 70s Hawaiian Leisure Jacket! Textured Off-White! Short Sleeves! 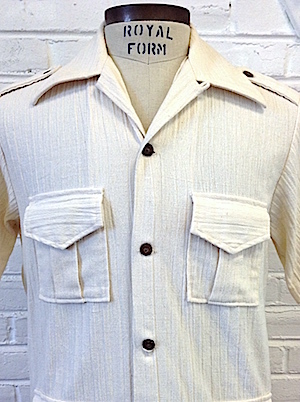 Mens vintage 1970s Hawaiian Disco Leisure Jacket! 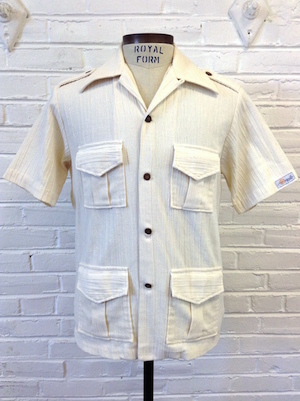 Crazy cool Hawaiian style disco leisure jacket in off-white with a subtle texture and short sleeves! Has a super wide, disco era collar. Closes in the front with brown marbled buttons with a loop neck closure at the top. Has four patch pockets with flap closures in the front of the jacket. Shoulders have epaulets on them that are secured with marbled brown buttons. Has a center back vent for a better fit. Jacket is unlined and light weight for warmer weather. Tagged by Mapili Hawaii. Polyester/Cotton blend.